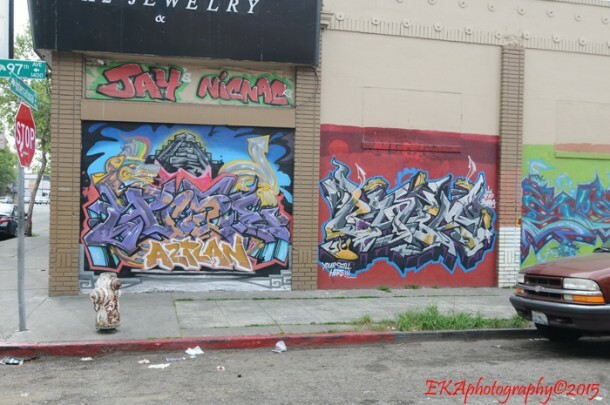 HomeWhy Are Representatives of Oakland’s Blight-Challenged Districts Reluctant to Commission Abatement Murals? The Community Rejuvenation Project (CRP) couldn’t agree more. In fact, as part of the Oakland Community Art Coalition, our efforts in 2012 led to the creation of a $400,000 budget line item for abatement murals in the city’s budget – 50k per Council district (plus the at-large seat). But those murals have been slow to come into existence. There was no official notification of the creation of the fund, as city departments and elected officials jockeyed back and forth over who would administer it, before it was placed in Council’s hands. In fact, the first public announcement of its existence was an Oakland Tribune article from October of 2013. The Alice St. mural is among those made possible by the city’s abatement fund. Essentially a discretionary fund aimed at mitigating blight, curiously, it’s been ignored by representatives of two of the most blight-ridden districts. With the 2014-15 fiscal year almost over, and uncertainty around whether the abatement mural budget will be renewed, we were puzzled to hear—from two reputable City sources—that neither Brooks nor D7 Councilmember Larry Reid has spent a dime of their abatement mural set-aside. Over the past few months, CRP has reached out to both Brooks and Reid and sent them proposals for murals in their districts. Brooks did not return any of our messages, while Reid told us over the phone that “he wasn’t interested” in any new murals. It’s difficult to rationalize the logic behind this. 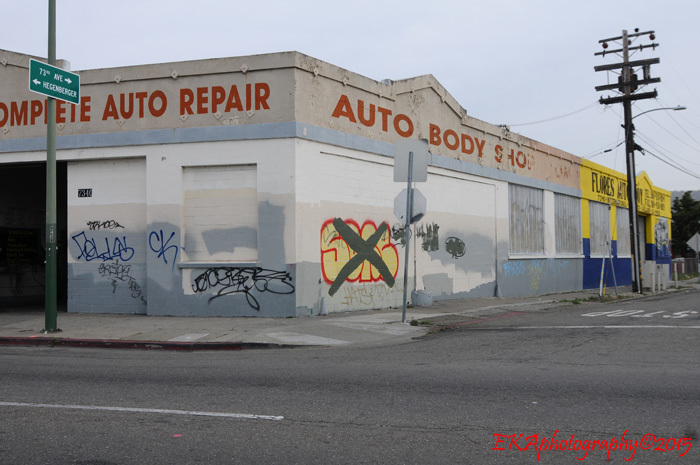 Both D6 and D7 suffer from some of Oakland’s most-visible blight and have been hit hard by taggers. Meanwhile, several other Council members have used their abatement allotment to support various public art murals, including CRP’s Alice St. Project on 14th and Alice Sts., Attitudinal Healing Connection’s Superheroes II on 35th St. and Market, and an upcoming project on 7th St. in West Oakland to be commissioned by Bikes 4 Life. 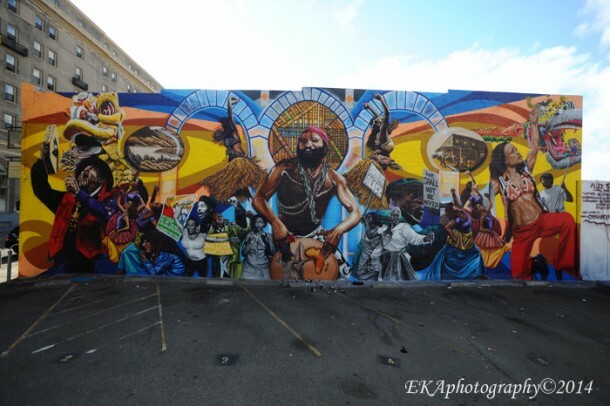 Incoming D2 Councilmember Abel Guillen recently issued an RFP for murals in his district. So why would Brooks and Reid flat-out refuse to spend money which has already been allotted for murals, which will likely expire in June? This D6 wall shows that repeated buffing has proved an ineffective method of abatement. “We have communities that haven’t been taken care of for a very long time,” Brooks went on to tell Hard Knock listeners. Few would argue with that assessment. Yet if Brooks is willing to say on the radio that the city needs more public art in underserved communities, why wouldn’t she take advantage of a prime opportunity to commission it? To assess the situation in D6 and D7, CRP Executive Director Desi Mundo and Communications Director/photographer Eric Arnold recently did a “ride-by” of various locations in those districts, mainly among high-traffic streets and other spots at high risk for taggers. Some of what we found was unsurprising: a former Pak’n’Save store in D7, which now sits empty with a chain-link fence around it, which has become a gallery for tags and throw-ups; A bombed-out high-profile wall within view of the new Air BART connector –a $500 million project; fresh tags on recently-buffed walls. We also observed several businesses who have commissioned murals which have thusfar escaped further defacement. This D7 wall is visible from the AirBART tracks. We also rode by 77th and Bancroft, the former location of “Brighter Than Blight,” a temporary art installation at a former housing project demolished in 2013. The installation, championed by Brooks and featuring spoken word artist Ise Lyfe and various Oakland artists, cost a reported $90,000 to produce and ran for a mere six days in total, but garnered reams of positive publicity for Brooks, at the time facing a scandal over three separate investigations which concluded she violated city law. 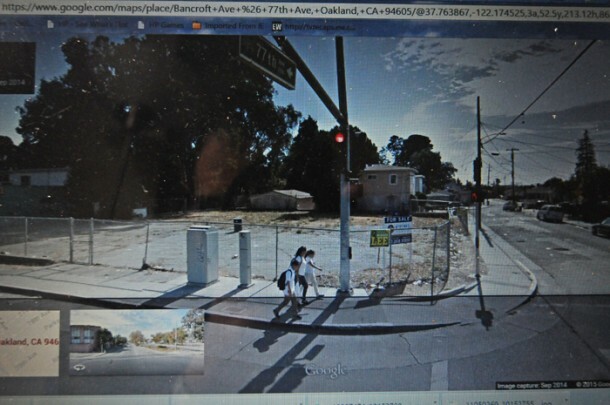 This Google Street View screenshot of 77th and Bancroft shows no evidence of a permanent art installation. Although the project’s website said some of the art would remain installed onsite, we couldn’t see any evidence of it in the empty yard, which is now owned by Phil Tagami’s CCIG real estate holding company and will presumably be the site of a future development. It’s also unclear whether any of the art was ever used in a traveling exhibit promised on the project’s website; neither the site nor the Facebook page had been updated since June 2013, when the installation ended. What did surprise us, however, was the somewhat organic creation of an impromptu arts district along Int’l Blvd. which straddles the D6/D7 border and features colorful vibrant murals, which are, at least, a step up from random and haphazard tagging. In some ways, this is a good thing, since it indicates artists are taking to the streets and doing what elected officials have failed to do. But unlike officially sanctioned projects or the “black and brown unity” series of murals commissioned by East Side Arts Alliance in the San Antonio and Fruitvale districts, these colorful artworks were likely done without community input or approval, or any oversight from the city’s Cultural Arts Department, which manages the Public Art Fund. Whether legal or illegal, they run the risk of being buffed out by city crews, who are reportedly targeting public aerosol art which is predominantly letter-based (as opposed to featuring visual imagery). Letter-based murals are at high risk for city abatement, whether sanctioned or not. While basic abatement will continue to tap the city’s coffers (to the tune of an estimated $1m/year) and yield limited, short-term results, the injection of 40% of the amount spent on returning walls to a blank canvas state could make a discernible difference – if Council spent their allotted budgets. When done right, murals not only deter tag vandals, but offer opportunities for creative placemaking and community engagement, as well as uplift neighborhood residents with vibrant imagery. All stakeholders—Councilmembers, the city’s Cultural Arts, Public Works and Parks & Rec departments, muralist organizations, and the community itself—stand to win from a progressive, proactive and cross-sectional policy aimed at incubating arts districts and mitigating blight in the city’s most neglected areas. 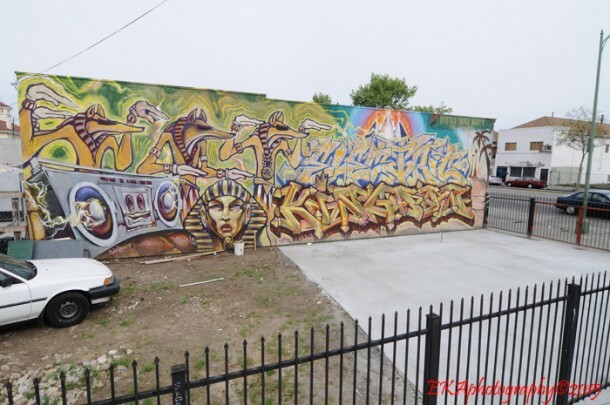 So it seems to be a no-brainer to urge Brooks and Reid to spend their abatement mural allotment, as well as push for the abatement mural budget to be renewed for the 2015-16 fiscal year. Either way, the writing’s on the wall. If you live in D6 or D7, let Larry Reid and Desley Brooks know you support blight reduction through mural creation. Your phone calls and emails can make a difference!